How would I replicate my Aperture projects in Lightroom? I think it’s helpful if you can try to remember that Lightroom’s Folders panel hasn’t got a real equivalent in Aperture. Folders represent the physical location of your Finder folders – but in Aperture’s interface you never really see these folders and the nearest you get is the Relocate Originals menu command. This dialog box is for managing the physical location of files – not for managing projects or categorising your pictures. In Lightroom, the Folders panel may be a major element in the interface, but like Reorganise Masters it’s all about the physical location and safekeeping of your photos – the Folders panel is not about project organisation or categorisation. As a general observation, Lightroom users tend to make more use of traditional IPTC fields for structuring and organising their catalogues, and I’d recommend ex-Aperture users adopt this practice (if you ever leave Lightroom, IPTC fields are easier to take with you). For example, I’d recommend the Job field for project names – eg Lakeland sports, Grasmere Show 2014 etc. Can someone help me. I have a large aperture library, 245gigs 60,000 photos. I am attempting to move over to lightroom classic 7.2. After importing 1154 photos, the import stopped, stalled. Nothing for 2 hours. I’ve seen where this is a problem, and I read that you can bifurcate the aperture library to solve the problem. I can not determine HOW to do that and if it will work. Any advice would be greatly appreciated. In Aperture, you can use File > Export Project as New Library. Also read this post http://lightroomsolutions.com/articles/migrating-from-aperture-to-lightroom-where-do-i-begin/ which gives advice about preparing before migration and about the best options to use. I think it’s generally better to make everything referenced in Aperture (File>Relocate Originals), and to use the LR option to import in place, which is quicker and means no risk of running out of disc space. I’m about to transfer 3 Terabytes from Aperture to LRCC (Lightroom Creative Cloud, which contains LR). Of course we will use the built-in importer. I am most upset about my “smart albums” on which I’ve lavished enormous amounts of time. They are simply based on 4* and 3* ratings; however, there may be 11,000 shoots representing work over many years,and each shoot has 2 smart albums. Think how many manual moves you would have to make in order to recreate these as sub-Collections of Collections in LR. An impossible task, unless, of course, there were some way to do it collectively. I can’t imagine there is. Please also tell me if there any improvements or changes now that we’re in 2017. I also think you should warn all previous Aperture users that with newer MAC-Pro computers (I believe from May, 2015 on, but double-check date), YOU WON’T BE ABLE TO ACCESS APERTURE ANY MORE, even if you’ve updated to 3.6. Laura, do you want to explain your comment about not being able to access Aperture any more? My understanding is that if you registered Aperture, you can still download and install it from the My Purchases section of Apple’s App Store. There would be a problem if you never registered it, and don’t have the installation CD. But you may mean something else. Dear John, During my most recent visit to Apple store here in Manhattan, when I updated my 2008 MB-Pro to Yosemite from Snow Leopard, I had to go though a complex process to upgrade Aperture to 6.3. We were doing all of this so that I could migrate my material to CCLR. I was severely warned that I had to do the transfer on the current machine, because if I purchase (as I will be forced to do) a more recent MB-Pro (in order for LR to run efficiently, since I am told it will slow up my older MB-Pro too much), I will not be able any longer to access Aperture. Do of course check with your local Apple experts to verify this. If this is true, there would be no point to re-purchase Aperture or even to think about using it with updated machines. I asked whether I should keep my several external drives with Aperture images on them as back-ups, and the staff at the store said, “No point to do that since you won’t be able to access that material. Just delete and use them for something else.” I hope the news is not too disheartening. If you have information that contradicts this, please share it with all of us. One of the replies in this thread indicates that metadata in “captions” will be automatically brought over. As for smart albums, is it worth it to give thousands of images new keywords linked to smart albums so they will be properly sorted when in LR? Perhaps it can be done in “batches”? Or should I just resign myself to recreating smart albums as “collections” or “sub-collections” once transfer is over? I hope more than one person will see this rather desperate query & respond! Thanks again. I do think you are wrong about Aperture and recent Macs. Your luck is out if you only have the installation CD and hadn’t registered Aperture with Apple. But if you bought it from the App Store or registered it, you can install and run it on the most recent Macs and OS. You just have to install it from the Purchases section of the App Store. As for your albums and smart albums, in general Lightroom is happier with standard IPTC metadata. So captions and titles will automatically come over – but stuff like Aperture projects, Aperture folders and albums are proprietary. Adobe can bring over projects, but there’s a limit to how much proprietary info they can replicate. My suggestion would be to see how much info can be copied into standard IPTC fields, which Lightroom would then be able to read. In general, Lightroom users tend to use standard IPTC fields for things like projects, while Aperture users use standard fields less than they should. Also remember that sub-collections may be less necessary. 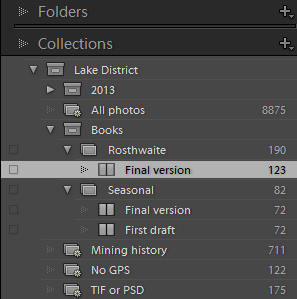 Lightroom has the Library Filter (the 4+ columns) which takes the place of many subdivisions of collections/projects. Sorry to have let some time go by. In answer to your most recent comments, I am registered. I will try to absorb what you have written. One of my problems is that I lent my large, official Aperture manual to an assistant and never got it back. I couldn’t find a used one on Amazon. Meanwhile, here is another urgent issue. I should have organized everything by date but did not. Whether introduced as managed or referenced files, I do not want the resultant Finder files organized by date! I have elaborately arranged my “projects” (and related “smart albums”) by shoots (occasionally 2 shoots in one) indicated by month and numbers—e.g. April, April2, April3, etc. Can you think of a clever way to get around this? As for IPTC fields, these got created automatically. It would be impossible now to enter data into individual photos in Aperture. Are you suggesting “batch” changes affecting IPTC fields? What would be the steps? I am new to this problem. Are there more recent (January 2016) Blogs/articles on this subject that I can study ? The basic concept remains very much the same, Bill, that “Collection Sets + Collections = Aperture Projects, Albums, Books, Slideshows etc” and that Lightroom encourages more use of standard IPTC fields. One tool that I’ve found very useful in migrating my large Aperture library over is Aperture Exporter. Not only does it help preserve final outputs by generating JPEGs/TIFFs for adjusted photos, it embeds album keywords into exported files so that they can assist you when using Lightroom’s filters to mirror Aperture albums as Lightroom collections. You can find Aperture Exporter in the App Store. I had A LOT of Aperture projects and this tool helped a lot. Yes, I actually mention it in my Moving from Aperture article and it automates the preparation steps. This article is about how you would implement an Aperture-like project workflow in Lightroom, and I wouldn’t recommend using folders to represent projects.